Shaina Gabala is a Yale Young Global Scholars (YYGS) alumna who is passionate about art. Her YYGS experience inspired her to create a comic book illustrating her memories during the program. For as long as she can remember, Shaina has been painting, drawing, and starting comics which she never finished. Out of these, painting has remained her core artistic activity, but she also engages in digital design; friends and family often hire her to design flyers and promotional material for various events. Shaina made her first comic during her junior year in high school, while working on a scientific research project. Wondering how she could present her research conclusions in a way that could be easily accessible to everyone, she decided to present her ideas in comic book format. Hungry to follow her passions and learn more about science, Shaina applied and was accepted to the 2018 Frontiers of Science and Technology (FST) session at YYGS. During the program, Shaina joined the YYGS Communications Team, a group of students tasked with capturing and documenting the YYGS student experience. Encouraged by her team leader, she decided to write and illustrate a comic about her experiences before, during, and after the program. She started writing the comic two weeks after returning home to Abidjan (the Ivory Coast). 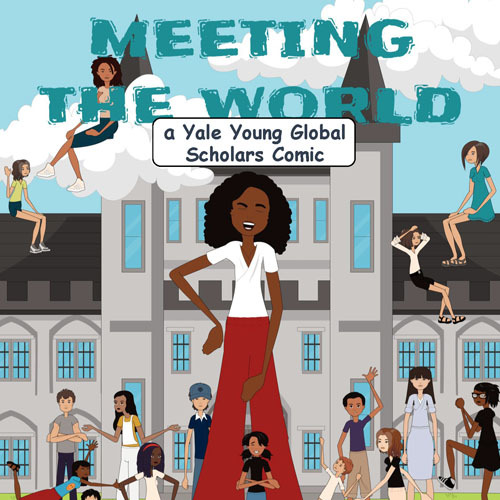 The title of Shaina’s comic, “Meeting the World,” is an apt description of her experience at YYGS. “YYGS allowed me to meet multiple ‘worlds’: students from so many different countries, a new world of learning experiences, [and] my ‘internal world,’ by challenging myself to dance at the talent show and becoming more extroverted,” she says. In college, Shaina plans to pursue her two passions, engineering and art, simultaneously. Ultimately, it is her goal to make science more accessible and understandable through artistic illustrations.